Elton R. Prewitt is a visiting researcher at TARL. This article is part of TARL’s June 2017 newsletter. The current work at the site of Infierno Village in Val Verde county is a continuation of that begun by Dave Dibble and a crew of volunteers, myself included, in 1974 through 1976. 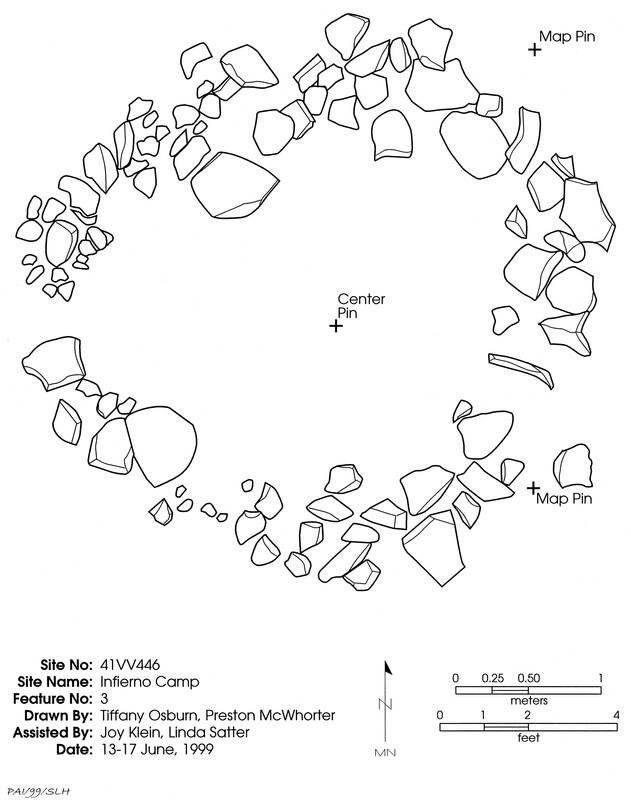 At that time, Dibble identified three areas where clusters of circularor semi-circular stone alignments were present, ostensibly representing the locations of prehistoric wikiup-style structures. After laying out a large survey grid, the team identified about 75 to 80 stone alignments, establishing the basic shape and size of the village. It stretches roughly 800m NNE to SSW, and reaches widths of 150m–unique in this area and potentially extremely significant for understanding prehistoric lifeways. A few selected artifacts were collected during this survey, and included a small number of untyped arrow points and end scrapers, and a couple of brownware potsherds. Occasional burned rocks and small thermal features were noted in the survey. The middle complex at Infierno Village. This is only one of three large clusters of alignments and features at the site. Work at Infierno stopped until 1999, when another crew of volunteers and I began re-mapping the stone features with the assistance of a total station. Between 1999 and 2001, we took transit readings near the center of each identified stone alignment in addition to topographic readings. For ease of reference, the three groups of stone alignments identified by Dibble were formally designated as the North, Middle, and South clusters. Scale drawings were made of six of the stone alignments. As in the 1970s, we stopped work at the site after access was denied. After a number of casual visits in the interim, I again resumed work at Infierno Village in 2016 with assistance from a few select volunteers. The original grid points were relocated and readings were taken at each using a hand-held GPS unit. GPS readings were also taken near the center of as many of the stone alignments and thermal features as could be located. Volunteers Dave Gage and Mark Willis took digital images of the site and many of its features using drones and hand-held cameras. This was followed by collection of high-resolution drone imagery in December 2016. Work done by Willis and by Sandy Hannum has allowed us to combine the original grid, the drone imagery, GPS data, and Google Earth layers into a precise, layered map of all the known features of the site, with the majority of the features clearly or partly visible. 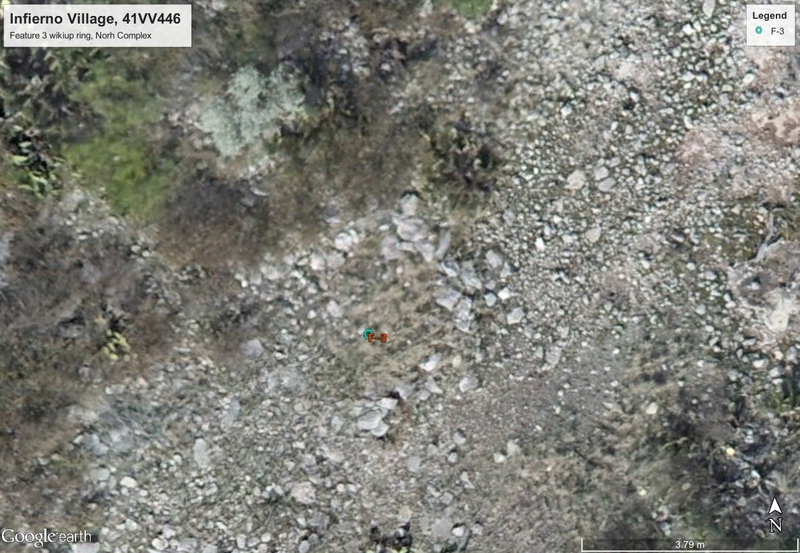 High-resolution imagery of one of the many stone alignments in the North complex, Feature 3. Scale drawing of Feature 3, Infierno Village. In sum, 150 stone alignment features at Infierno Village have been verified by visual means using the drone imagery overlain on Google Earth. Another 66 potential stone features await revisit and verification. Analysis of the drone imagery allowed us to identify 28 visible possible stone features that were not included in the 216 locations identified in person by our teams at the site. Further study of Infierno Village has potential to greatly deepen our understanding of local populations’ movement on the landscape in prehistoric times, as well as methods for resource procurement and social cohesion. I suspect that the site was used over a very long period of time, from the Late Prehistoric back into the Archaic period and perhaps even earlier. Building this precise map of the many features at the site is just the first step to investigating the long history of occupation at Infierno Village. Laura Cruzada, Lee Reissig, and Marisol Espino are guest authors from the Texas Department of Transportation’s public archeology outreach program. This article is part of TARL’s June 2017 newsletter. On June 19th, 1865, the news that slaves were free finally reached Texas. Every year, communities gather to celebrate the emancipation of slaves in Texas. This Juneteenth, we highlight an exceptional story of freedom that is featured on Texas Beyond History. Through archeological investigations, you can read about Duval, the once thriving community of freed African-American slaves. This community was located in what is now the interchange of Loop 1 and Parmer Lane in north Austin. When a highway extension was planned near the interchange in the 1980s, TxDOT archeologists utilized old maps, records, and an aerial photo from 1937 to identify the location of a historic farmstead. Elizabeth and Rubin Hancock, residents of the Duval community. Photo copyright Texas Beyond History. 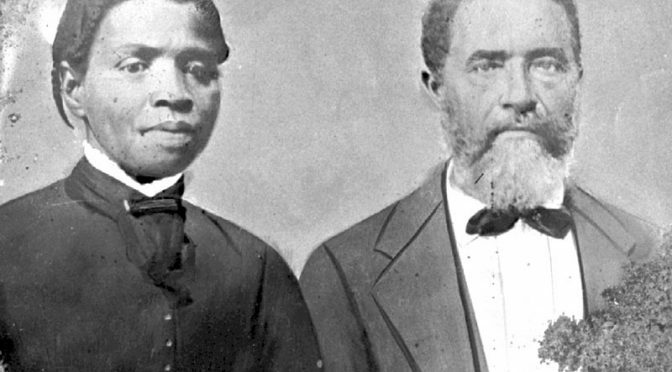 In Duval, freed slaves Rubin and Elizabeth Hancock purchased farmland where they raised their five children. 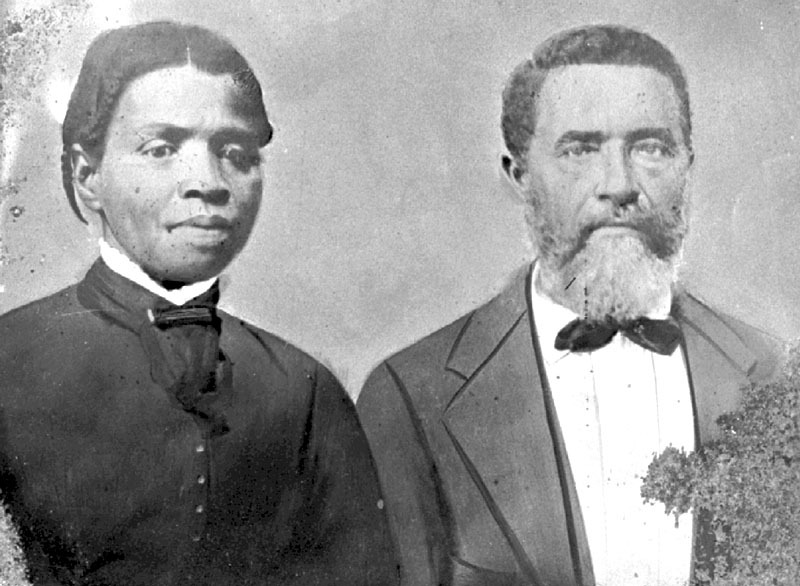 Elizabeth and Rubin Hancock were both born into slavery in the 1840s in Tennessee and Alabama, respectively. Prior to the Emancipation Proclamation, the Hancocks, along with Rubin’s three brothers, all belonged to Judge John Hancock, a unionist who fiercely opposed secession despite his reliance on slave labor. Judge Hancock was even removed from office after being elected to the state legislature in 1860 for refusing to pledge allegiance to the Confederacy. At the end of the Civil War in 1865, Rubin and his three brothers bought land north of Austin, possibly with the help of Judge Hancock. It was here that Elizabeth and Rubin established a productive community of African-American farmers complete with a church and school for their children. According to family members, Elizabeth and Rubin’s home was made of lumber, with two rooms under the main roof and a separate addition which contained the kitchen. Rubin’s granddaughter, Mable Walker Newton, remembers the two main rooms having large glass windows and wooden shutters. Water was hauled in from a well, cooking was done on a cast iron stove, and kerosene lanterns illuminated the log cabin. The family raised cows and pigs, grew cotton, and harvested a large garden. With the help of the A&NW railroad, beginning in 1881, surplus was transported and sold to local store owners in Austin. The addition of the A&NW railroad also brought new families. The growing community came together at St. Stephen’s Missionary Baptist Church, where in addition to worship and other social gatherings, classes were taught. In the evenings, large social gatherings with neighbors, friends, and relatives could be expected. The children would find entertainment with marbles, baseball, and homemade cardboard dominoes. All of this was confirmed through intensive investigations and research, now available to the public on Texas Beyond History. The families of Duval achieved a level of success that most people of their time – African-American and Whites alike – did not. The Hancock brothers in particular were landowners and each worked their own farms. The brothers were all registered to vote, and each married and raised a family. While Elizabeth Hancock passed away in 1899, Rubin continued live and work on the farm into his sixties until his death in 1916. The Hancocks’ descendants continue to live in the Austin area today. Rubin’s three surviving children kept the farm until 1942 when the house was removed from the site. By the time that TxDOT archeologists arrived to investigate the area, all that remained on the surface was a well, a chimney hearth, and sections of a fence and stone wall. Excavations at the farmstead revealed possible stone piers of the house, trash areas, along with scatters of artifacts. The 9,000+ artifacts provided archeologists with an idea of the farmstead layout and an insight in to day-to-day life on the farm. Excavated marbles show what sorts of games children enjoyed playing. Recovered items such as combs and buttons provide a visual of the local trends. A canine burial even lets it be known that people in Duval loved their furry companions just as much as modern Austinites. In addition to cultural remains, oral histories and archival information was gathered to better visualize the Hancock family and farm. As TxDOT continues to work and build a safe and reliable transportation system, the Cultural Resources Management (CRM) program considers the impact of projects on archeological resources and historic properties like the Rubin Hancock Farmstead– resources we know can be important to communities across the state. Dr. Tim Perttula and Drew Sitters are visiting researchers at TARL. This article is part of the June 2017 TARL newsletter. 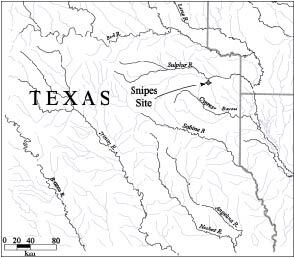 The Snipes site (41CS8) is a multi-component prehistoric site on the Sulphur River in Cass County, Texas (Figure 1). The site was found and investigated as part of a River Basin Survey project done in 1952 directed by Edward B. Jelks (1961). We recently had the opportunity to take another look at the collections from the site (held by TARL) to better understand the native history of the site, and to clarify the character of the material culture remains that are associated with the different periods of use at the Snipes site since the Late Paleoindian period. Figure 1. The location of the Snipes Site in East Texas. Figure prepared by Lance Trask. The main feature of the Snipes site is a cemetery with nine burials; two of the burial features had multiple individuals (two or three persons). The burials had been placed in pits in either flexed or extended positions. Funerary offerings with the burials included a few grog-tempered ceramic vessels, including one Coles Creek Incised, var. 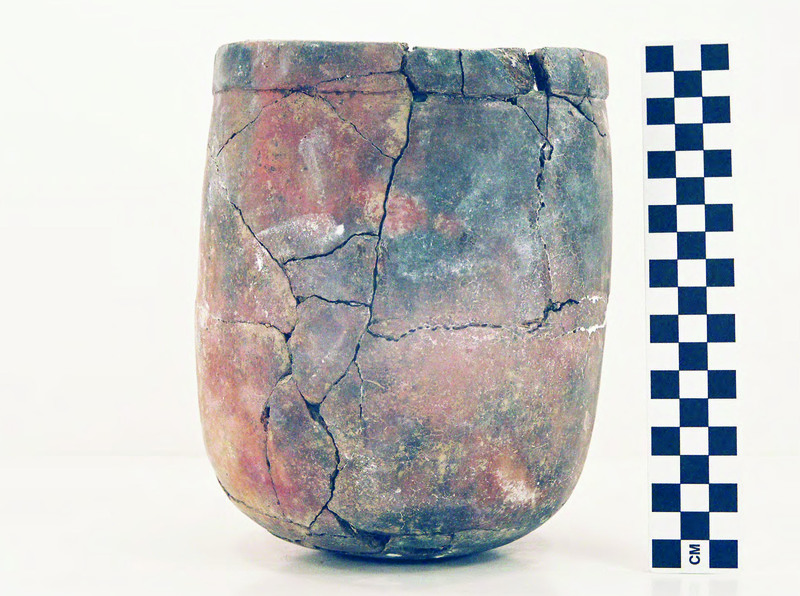 Stoner bowl (Figure 2a-b) dating from ca. A.D. 550-700 (Brown 1998:8, 53) and several small plain bowls and jars of the Williams Plain type, as well as lithic artifacts (primarily pieces of lithic debris) in Burial 1 (Jelks 1961:44). These funerary offerings indicate that the cemetery was used almost exclusively during the Late Woodland period. 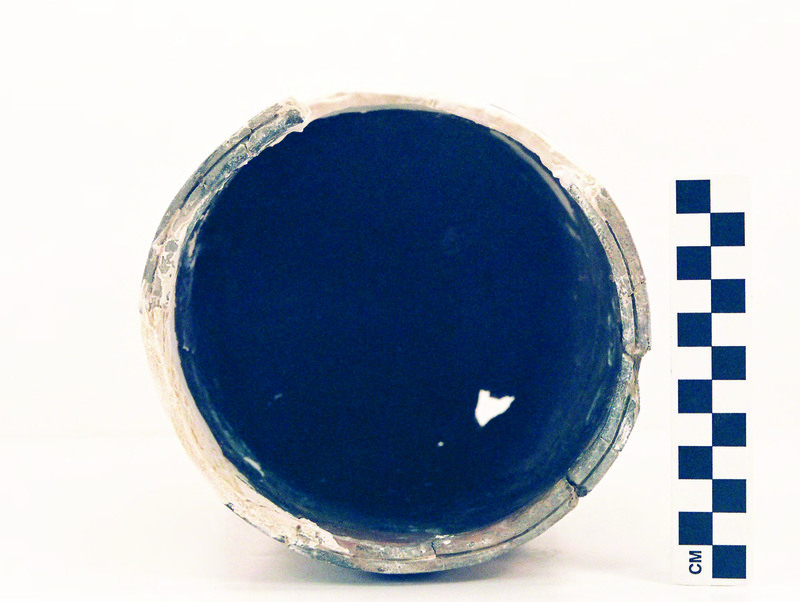 There is one ancestral Caddo vessel from a burial excavated by I. B. Price at the Snipes site that may be associated with the Early Caddo period use of the site. Figure 2. Coles Creek Incised, var. Stoner vessel from the Snipes Site. Above: side view. Below: looking down at the incised lip line. Photographs taken by Bo Nelson. The lithic and/or ceramic artifacts recovered in the burial features as well as habitation contexts at the Snipes site indicate a very limited use of the site during the Late Paleoindian and Late Archaic periods, based on finds of a single possible Plainview lanceolate and late Archaic Wells and Yarbrough types. The principal occupation of the site took place from ca. A.D. 400-800 by a Fourche Maline culture group, and is marked by Gary, var. Camden dart points, ca. A.D. 700-800 arrow points (Friley and Steiner types), grog-, grog-bone-, and bone-tempered Williams Plain and Cooper Boneware sherds and vessels, and Coles Creek Incised, var. Stoner and var. Ely vessels and/or sherds. There were also ancestral Caddo settlements at the Snipes site. The first dates from ca. A.D. 800-1200, in the Formative and Early Caddo periods. The ceramics from this component include sherds from Davis Incised, Dunkin Incised, Kiam Incised, Crockett Curvilinear Incised, Pennington Punctated-Incised, and Holly Fine Engraved/ Spiro Engraved vessels; one Alba arrow point is part of this component. A single Haley Engraved sherd indicates a very limited use of the site by Caddo peoples between ca. A.D. 1200-1400. The last use of the Snipes site by ancestral Caddo peoples took place after ca. A.D. 1500, and this component is associated with the Texarkana phase, defined on the basis of sites in both the Red River and lower Sulphur River basins. 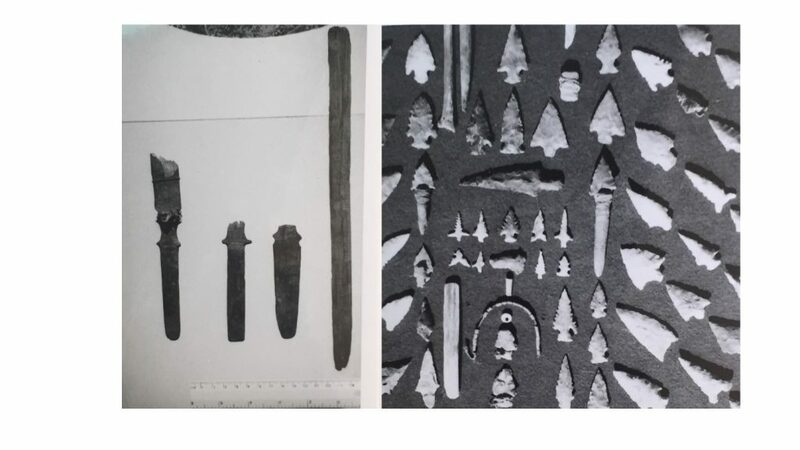 This component includes sherds from Barkman Engraved, Cass Appliqued, Keno Trailed, Simms Engraved, and Pease Brushed-Incised vessels as well as a single Maud arrow point. 1998 Decorated Pottery of the Lower Mississippi Valley: A Sorting Manual. Mississippi Archaeological Association and Mississippi Department of Archives and History, Jackson. 1961 Excavations at Texarkana Reservoir, Sulphur River, Texas. River Basin Surveys Papers No. 21, Bureau of Ethnology Bulletin 179. Smithsonian Institution, Washington, D.C.
Dr. Bryon Schroeder is a Research Associate at the Center for Big Bend Studies at Sul Ross University. This article is a part of TARL’s June 2017 newsletter. Spirit Eye (41PS25) is a prehistorically occupied cave system located in Presidio County, Texas just north of the Chinati Mountains (Fig. 1). The cave system is situated on the lowest level of a North/South trending limestone cliff. Access is possible via two entrances, lower and upper entrances that lead to a central U-shaped main chamber that connects with a smaller internal horizontal and vertical shaft system. Extensive prehistoric use of the cave is evident on the well-developed cultural talus deposit laden with thousands of pieces of debitage, various ground and chipped stone tools, and a distinct black anthropogenic soil. There are also historic food and beverage containers on this talus slope, remnants of years of looting into the rich and well-preserved prehistoric deposits. Figure 1. Overview of Center for Big Bend Studies excavation at Spirit Eye Cave, spring 2017. The deposits within Spirit Eye are not pristine. Evidence of looting is clear: outside both entrances mounds almost three meters tall of screened cave fill are the first indicators of the destruction. As you move into the internal chamber, the portion near the lower entrance resembles a mineshaft from untold looting exploits, and near the upper entrance from the back wall of the cave to the opening is a large stratified mound over a meter tall comprised of looted cave fill. The persons that mined Spirit Eye were all after the same thing–the unique perishable artifacts that this cave preserved (Fig. 2). Figure 2. Atlatl throwing stick fragments and hafted foreshafts looted from Spirit Eye, just one example of the perishable artifacts taken out of the cave. The artifact assemblage from Spirit Eye offers a unique and holistic view into technologies that made prehistoric adaptation to the Chihuahuan Desert possible. 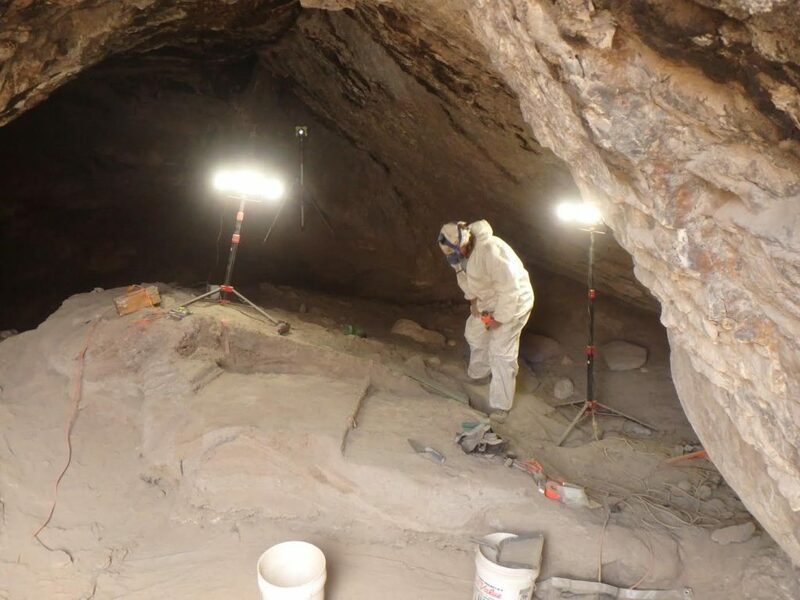 In an effort to salvage some of this valuable information, the Center for Big Bend Studies of Sul Ross State University began the first systematic excavations in the cave in early May of this year. In operationalizing the excavation, we knew it would be important to understand the periods of looting, and what has emerged is a complex and storied history. By the 1960s, artifact collectors at Spirit Eye conducted intense periods of excavation fueled by both black market values and personal curiosity. Understanding this history has enabled us to relocate and claim orphaned collections in curational facilities like TARL and private collections, all of which contain unrivaled artifact assemblages. These looted collections, including many artifacts and a mummified set of human remains recovered from a private collector in the 1990s and now housed at TARL, will be one aspect of our investigations. Our goal is to understand how the years of unsystematic excavation progressed and to develop research methods that can be used to salvage data from this and other extensively looted archaeology sites. Although our work is still ongoing, we have already recovered thousands of artifacts discarded by collectors, most of them perishable. 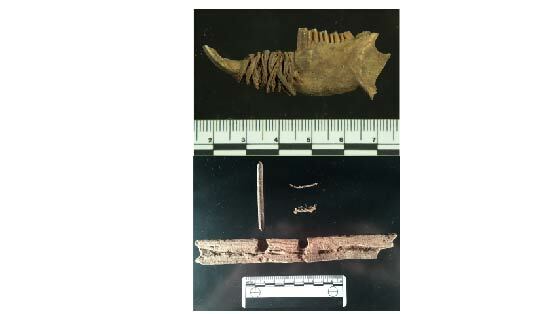 Not surprisingly, these include domestic artifacts like quids, human coprolites, cordage, various kinds of processed plant fiber, faunal artifacts, foodstuffs, and carved wooden artifacts (Fig. 3). The site, while severely impacted, holds far-reaching research potential that requires an unconventional research design. We are very much at the beginning stages of this research, but it is obvious that we can use Spirit Eye as a laboratory to push the possibilities of research in perishable artifact analysis. Figure 3. Recently recovered rodent mandible wrapped in organic cord, various cordage examples, whittled stick, and fireboard all from looted cave fill at Spirit Eye. mission. Family legend says that mission was the one and only Alamo in San Antonio! Many thanks to the owners, Evie Patton and the Hererra family. The Hererra Gate goes out for conservation work. The conservator is local to the Austin area, so it was a short trip! 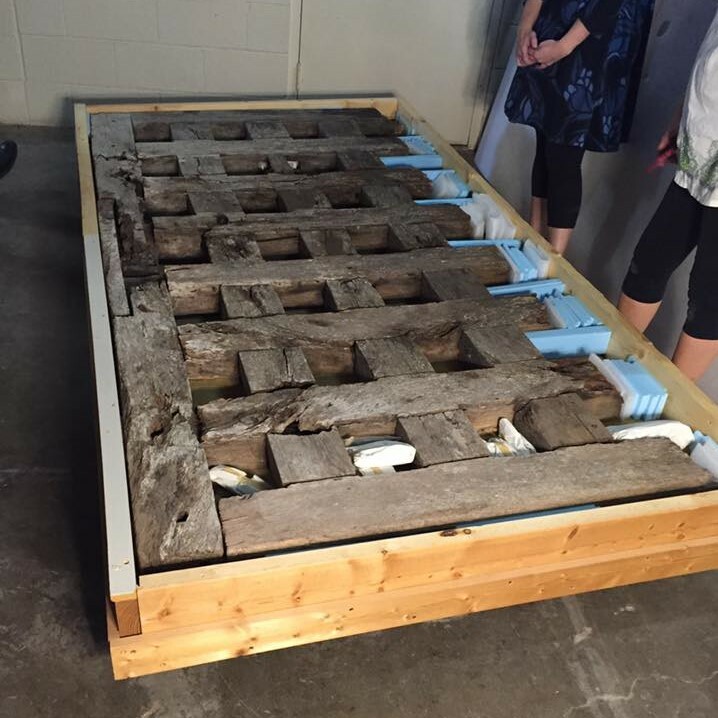 The Hererra Gate in its custom storage crate. Every school year, TARL is fortunate to have the help of many undergraduate and graduate students from UT and other colleges. TARL’s internship, work-study, and volunteer programs help students get hands-on experience in a laboratory setting as they explore their interests in archeology, bioarcheology, forensics, museum studies, and information science. This spring, we had quite a few of our great students graduate. We will miss having them around, but we are excited to see what they do next! Elizabeth Coggeshall, University of Texas class of 2017. TARL Human Osteology Laboratory intern Elizabeth Coggeshall graduated from UT this spring with an honors degree in Anthropology. 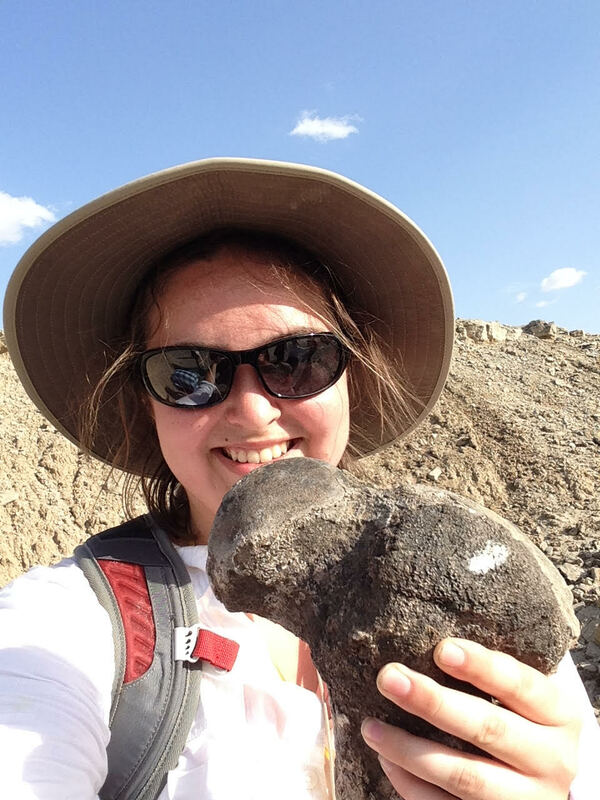 Elizabeth completed numerous skeletal inventories and analyses as an intern and volunteer at TARL while completing her degree. Her immediate plans include going to South Africa to do fieldwork on forest baboons for the Goudeveld Baboon Project hosted by Duke University. Afterward, she plans to complete a research project with Dr. Rebecca Lewis of UT, apply for graduate school for fall 2018, and spend lots of time with her tripod kitty, Hammy. Jessie LeViseur, Texas State University class of 2017. 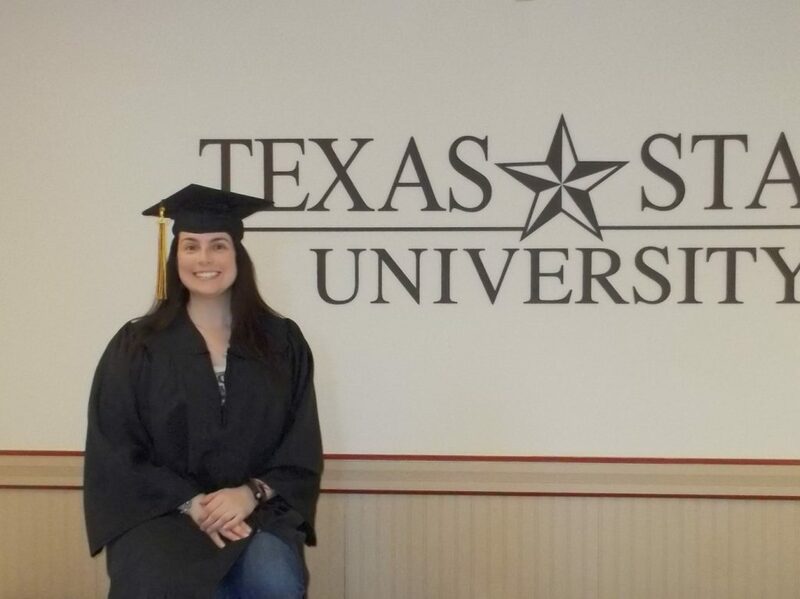 TARL Human Osteology Laboratory intern and volunteer Jessie LeViseur graduated from Texas State with a B.S. in Anthropology, focusing on forensics. She started volunteering at TARL in May 2015. She has had the task of checking the integrity of preservation of human remains in the TARL HO lab, as well as representing TARL at the 2015 TAS meeting, where she discussed her work on the WPA-era Harrell site rehab project. She has also completed a TARL internship, and now works part-time in our HO lab. Her goal is to work in a hospital or police lab doing forensic work full time. Kimberly Noone, University of Texas class of 2017. TARL Collections & Osteology intern Kimberly Noone graduated from UT with a degree in Anthropology. 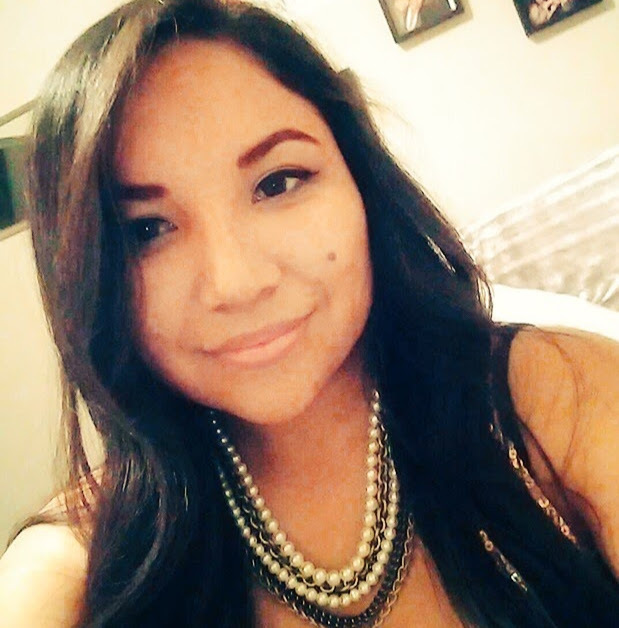 As an anthropology student she focused on biological anthropology and archaeology. During her time in the TARL Osteology Lab she worked to catalog and re-analyze the collection of human remains, and in our Collections department she completed an updated inventory of the faunal remains collection from the Bonfire Shelter site in southwestern Texas. 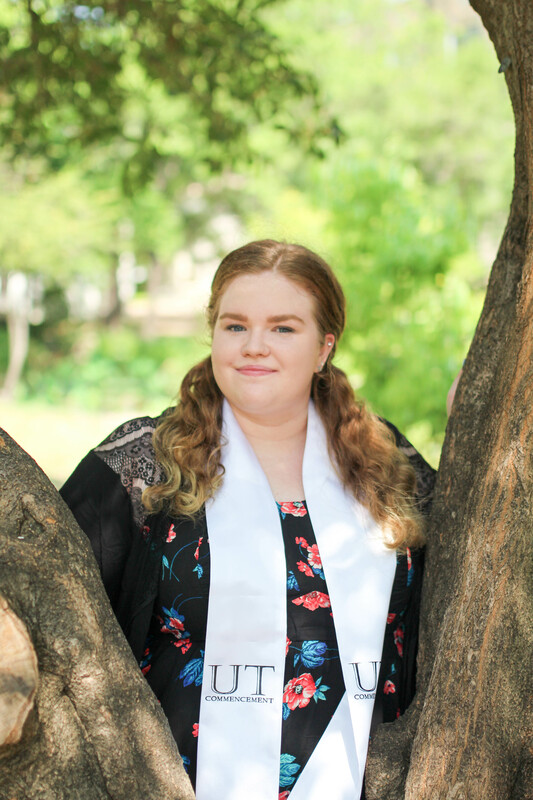 Kim initially had a hard time choosing a major at UT, not declaring until the beginning of her junior year, but she discovered an interest in archaeology after taking the human osteology course offered by Dr. John Kappelman. She found the study of burial practices and human remains intriguing and that helped her plan for her future. Kim plans on returning to school to eventually pursue a Ph.D. in Archaeology. Her experiences working at TARL have solidified her interest in lab work and working with remains. She hopes to be able to study human burial practices, using her knowledge of osteology to further research paleopathologies. Christina Uribe, University of Texas class of 2017. TARL work-study student Christina Uribe just graduated from the University of Texas at Austin with a Bachelors of Arts in Anthropology. She is also double majoring in Chemistry at in the College of Natural Sciences. Tina originally came to UT as a natural sciences major, but during her first year she took the anthropology introduction course and has been hooked ever since. After that, Tina continued taking various anthropology courses that included topics such as primate anatomy, Maya civilization, and digital data systems in archaeology. She eventually added anthropology as a second major and studied abroad last summer at the field school in Belize as part of the Programme for Belize Archaeological Project. 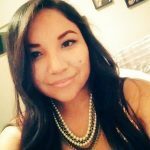 This past year, Tina was a work-study intern at TARL. She primarily handled data entry, transferring site records and their respective inventory to an online database. Through this work she was able to gain a greater understanding of Texas archaeology. In the future Tina would like to study biological anthropology further and find a way to combine her studies in chemistry and anthropology, possibly in forensics. After finishing up her Chemistry degree at UT this year, Tina plans to get some additional experience to help her narrow down her career options. Once she has a clear idea of what she’d like to focus on, she will attend graduate school to further her education. Morgan Lubenow, University of Texas class of 2017. 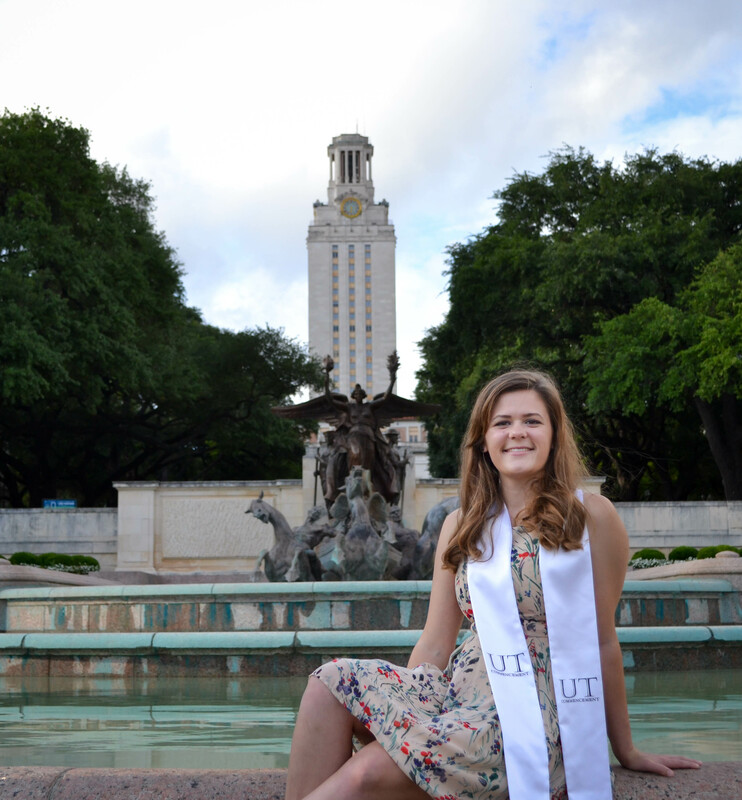 TARL volunteer Morgan Lubenow recently graduated from UT with a B.A. in Anthropology. Morgan’s last year was a whirlwind, as she completed a study abroad course at the Turkana Basin Institute (Turkana, Kenya, Africa) in the fall semester and a full work and internship schedule in the Spring Semester. Currently Morgan is working for the Girl Scouts of Central Texas as a Program Manager for an overnight camp called Camp Kachina. This position is a longtime goal for Morgan, so she is very excited. After her summer camp position ends she’ll be starting up a road trip to see as many of the US’s National Parks and Historic sites as possible. She’ll be traveling August through May with a few stops home. After her epic road trip, Morgan hopes to attend graduate school beginning in the fall of 2018. She is currently looking at Duke as well as Stony Brook University. Not all of TARL’s students have graduated and left us! Former intern Sheldon Smith and volunteer Meaghan O’Brien are currently building up their field experience and archeological skills at the UT Programme for Belize Archeological Project. 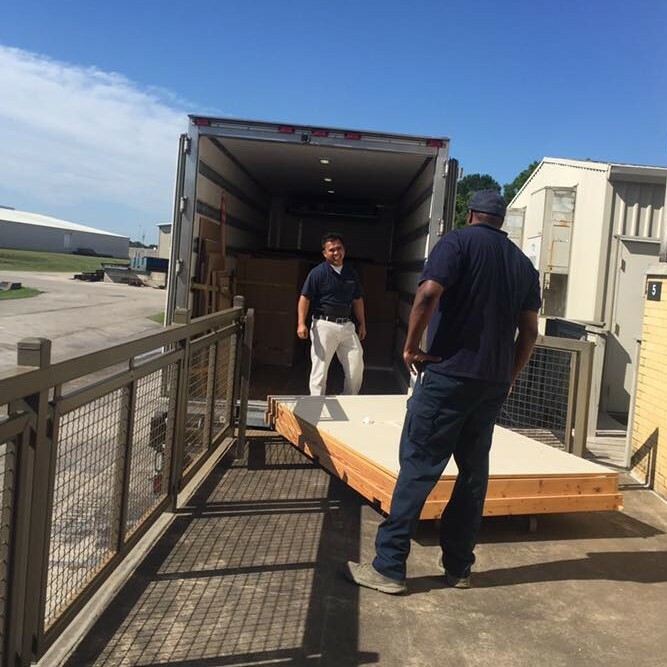 TARL volunteer and part-time collections staff Katie Kitch is volunteering with the Texas Historical Commission. And, several of our wonderful volunteers are still coming out to TARL regularly to help us out with important lab work and collections tasks. Thanks to all our volunteers!